Thank you to Tim Smith of the Baltimore Sun for bringing this story to our attention. The list of Kennedy Center Honors for 2009 has been released. On it, are people who have been said to have put the POP in Pop Culture: Mel Brooks (actor, producer, writer, musician), Dave Brubeck (jazz musician), Bruce Springsteen (rockstar) and Robert de Niro (actor). But, holding up the classical side with great ease and strength will be soprano Grace Bumbry, whose career in the world of opera was, in a word, remarkable. Initially, Bumbry began her career as a mezzo, but later expanded her repertoire to include many dramatic soprano roles. In the mid-1970s and 1980s she completed her relatively successful transition into being a "full time" soprano; but in the 1990s, as her career approached its sunset, she returned to mezzo roles. During a singing career that spanned from her 1958 debut in Paris as Amneris to her 1997 Klytämnestra in Lyon, she became part of that generation of singers that helped break down barriers placed against African Americans. 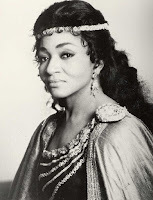 Need I remind... she was cast by Wieland Wagner (Richard Wagner's grandson) as Venus at the Bayreuth Festival in 1961, at age 24 - the first black singer to appear there. Conservative Germans were appalled, and the ensuing media attention shot her to international fame. She was subsequently invited by Jacqueline Kennedy to sing at the White House. She returned to Washington DC in 1981 to sing at the Inauguration of Ronald Reagan. Bumbry has long worn the mantle of "diva" with ease, style and (no pun intended) grace. Excellent choice, Kennedy Center Honors nominating folks.